Most districts experienced good spring growing conditions, and although NIWA has predicted a dry summer, that looks unlikely to commence early, so pasture production should continue until at least the end of the year. Various factors are affecting the dairy industry, including softness in the payout forecast and Mycoplasma bovis. Livestock transactions through the spring reflected the shortage of confidence. Demand for in-calf heifers should rise through the summer and herd purchases are also likely to increase as the season progresses. Early in the spring, service bulls were less sought-after than in recent years as dairy farmers opted for artificial insemination as one way to minimise stock movements. However, later in the season orders came through as some farmers decided they actually did need bulls. Fewer dairy beef calves are being raised this year by calf rearers. Dairy farmers have instead elected to rear them themselves, once again motivated to minimise stock movements. This year’s in-milk cow market has been seriously limited with few transactions, though that could rise, at least slightly, in December and January, post mating. Herd sales this year are likely to range between $1,800 and $2,000 per cow, around the same values as last year. 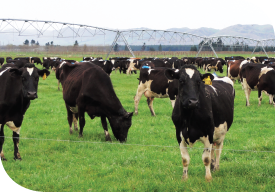 Farmers who have lost herds to Mycoplasma bovis, particularly in the South Island, are seeking to repopulate their farms, though criteria for re-stocking varies and, with lower cull numbers than some predicted, the market impact of this will barely be discernible. For sheep and beef farmers, the main spring focus was lamb finishing and cattle sales. As the lamb schedule is holding up at record highs, most sheep farmers remained positive. Excellent lambing percentages, with plenty of sets of twins surviving, means lambs may be slightly slower to reach the required weight this season, despite the quantity of feed available, which is particularly high in Canterbury. Store lambs will be sought after, reflecting the ongoing confidence in the lamb schedule, as well as the positive feed situation. At cattle markets, the preference has been for traditional well-bred beef breeds, which have achieved a premium over dairy beef. Rain has strengthened that market with an abundance of cattle offered for spring sale. Compared to last year, cattle prices have therefore eased slightly, reflecting where the schedule has gone. Tight killing space at the works has also negatively impacted pricing. Hundred kilogram bull calves started to sell in late spring. In an ongoing trend, buyers showed a marked preference for single origin animals, again stressing the premium developing around traceability in response to Mycoplasma bovis. Cattle are likely to sell well through the summer, albeit at slightly lower prices than last season. Meanwhile, as this season’s ram sales campaign progresses, farmers have more choice and greater value from the rams available than in previous years. Depending on what a farming business prioritises, ram breeders have programmes to deliver. This might include breeding resistance to facial eczema, breeding to improve the survivability of newborn lambs or emphasis on other characteristics, including Omega 3, eating quality and marbling. Ram breeders are speculating what the market requires, and what farmers are prepared to pay for. There are multiple different programmes designed to fit those commercial demands. Although prices at the ram sales are not likely to differ too much from last year, the value purchasers receive is increasing. Farmers buying rams have plenty of options. Compared to where we were five years ago, breeders have become more progressive in what they are seeking to achieve. Their programmes are more advanced, and the genetics able to be bred into a flock more sophisticated than they have ever been before. This year’s ram sales campaign will run until 30 January 2019 in Winton, Southland, with around 40 sales scheduled throughout the campaign and across the country.